Normally, when you see a jack on a piece of equipment, it is what it is. For example, an HDMI® jack is for HDMI® video. VGA is for VGA video, and so on. That all changed with USB-C. But, just because a piece of equipment has a USB-C port does not mean it can support all these items. Each host and client device may support only a few features and functions. The cable being plugged into that port may also be a limiting factor in what is supported. And the wrong cable can damage a device. An example is Alternate Mode DisplayPort (ALT‐DP). If your USB-C equipped device does not support ALT-DP, then plugging an adapter for USB-C to HDMI using ALT‐DP will not work. The only place you generally find information about what your USB-C port supports is in the user’s manual. How many of us read that? There is potential for interoperability issues in nearly all “BYOD” or “bring your own device” scenarios, such as happens every day in meeting rooms all over the world. ALT‐DP is probably the most common ALT mode, but it is the PC manufacturers’ choice whether their product is going to use that mode, requiring the end user to read their equipment manuals and specifications and be aware of the USB-C port features and supported modes for their specific machine. As more tablets and smartphones adopt USB-C connectivity, the proliferation of video signals and required adaption will increase. This may require additional USB-C adapters for specific signal subsets. Bring your own device (BYOD) technology in the meeting room. 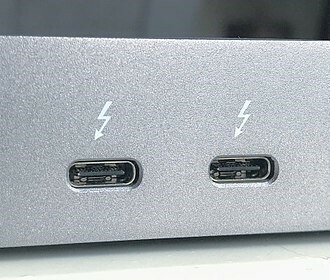 There is no magic bullet, no single adapter that can connect to all USB-C equipped devices and work. When using Apple products, you will have the best chance of success using an Apple adapter. For PC and other non‐Apple devices, we recommend the Liberty adapter, as the Apple adapter has proven incompatible with some non‐Apple products. For this reason, we recommend having both the Apple® USB-C multimedia adapter and the Liberty USB-C adapter to cover most applications. These two tools will give you the best chance of satisfactory results, and help put an end to the USB-C connector confusion. See our top USB cables here. Shoutout to our friends at Liberty AV Solutions for this great insight on USB. More info here on Liberty and link to the original blogpost.